Most of us are dimly aware (no pun intended) that before electric lights, but after candles, the civilized world got around at night with oil lamps. Few of us know that initially most of that oil came from harpooned whales whose blubber had been boiled. So, it was a great relief to the whale population when someone in Pittsburgh turned light-bearing people away from whales, and toward the foamy sludge bubbling up around salt wells. It seems incredible now, but then our forefathers and foremothers didn’t see any value in the petroleum oozing out of the ground. Samuel M. Kier was different. He was a visionary who historians call the Grandfather of the American Oil industry. But, hold off, he wasn’t an historic visionary right away. His first vision was to use crude oil to cure all health ailments. For a price. So-called patent medicines (they were neither patented nor regulated in any way) were in their prime in 1848. That’s when Kier discovered the petroleum that Mother Nature spewed forth onto his shoes could perform amazing wonders. Just drink it, or apply it to the affected areas, and the lame could walk, the blind could see. It also was a good lubricant. Suffering from’s the King’s Evil? It’ll take care of that, too. Oh, you don’t know if you have King’s Evil or not? Well, it’s tuberculosis. Millions had it then. Maybe that’s why it had so many names. Consumption was one. People wasted away as it consumed them. Ignorant, superstitious victims used to think they could be cured by a monarch touching them, or by touching a coin that the monarch touched. It was proof to them that God ordained the king to be king. Well, they didn’t know about Kier’s Genuine Petroleum. Actually, Kier’s wife, Nancy, had a lot to do with him bottling the remedy. She was suffering from the King’s Evil, and her doctor prescribed a medicinal oil from Kentucky that looked and smelled familiar. Kier had it analyzed. It was identical to the stuff contaminating his salt works. Before refrigeration, salt was needed to preserve meat. Kier’s operation was among many in Indiana County. His were near the aptly named villages of Saltsburg and Salina. They drilled holes until they reached salt deposits, pumped water down to dissolve it, pumped the brine out and then evaporated it over coal fires. What was left was salt. Unless petroleum got in there, too. So, Kier skimmed off the oil and put it to use. His advertising in New York City boasted how his petroleum was put up into bottles with nothing coming betwixt the lips of the consumer and Mother Nature. It went into the bottle just as it came out of the ground. Aside from the magic goo, Kier had at least two other things going for him. He operated boats that crossed the state on the Pennsylvania Canal. That gave him easy access to Philadelphia and New York markets. First, though, he sent men out in gaily colored wagons proclaiming the wonders of Kier’s Genuine Petroleum. Step right up! Then, if you are selling a miracle in a bottle, you need bottles. No place on Earth likely had more bottles than Pittsburgh. That brings us back to James Parton, the New York writer, who Now, Then Pittsburgh has followed the past three posts as he explores the Belly of the Burgh in 1866. Parton tours glassmaking operations in the city and talks of petroleum continually floating atop the Ohio River. Let’s see what he has to say. . . .The 15 bottle-works here produce the incredible number of 70 million bottles and vials per annum . .
. . .The Pittsburgh champagne-bottle comes nearest to being what a champagne-bottle should be, of any made in the United States. One in 10 of the best French bottles bursts in the cellar of the bottler; one in six of the best Pittsburgh bottles. But the truth is, we are such inveterate swillers of every kind of abominable mess that admits of being bottled, labelled, and advertised, that the Pittsburgh bottle-makers have not had time yet to develop the higher branches of their vocation. Any sort of glass will do for quack medicine. Is he thinking of Kier’s wonder cure? He doesn’t say, but moves on to explore how the nation’s window panes are made here . . .
Who would have thought that common window-glass is blown? It is actually blown like a bottle. The blower stands on a bench, and as he blows, he swings his tube to and fro, which causes the soft globule to lengthen out into a cylinder, five feet long and one foot in diameter. This cylinder is afterwards slit down all its length by a diamond, and placed in an oven, with the diamond-cut uppermost. As that oven grows hot, the cylinder divides where the diamond marked it, gently falls apart, and lies down flat on the bottom of the oven. There is our sheet of window-glass. As soon as it is cooled, it is cut into the required sizes by a diamond.
. . . The total value of the glass made at Pittsburgh every year is about $7 million, which is almost exactly one half of the value of our whole annual product of glassware. This is but one item of the yearly work done by Pittsburgh coal at Pittsburgh. 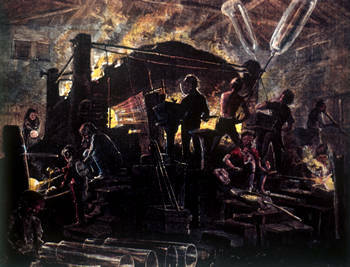 Other trifles are 16 potteries, 46 foundries, 31 rollingmills, 33 manufactories of machinery, and 53 oil refineries. Such a thing it is to have plenty of coal! Wait a minute. Did he say 53 oil refineries in Pittsburgh in 1866? What happened to drinking petroleum straight from the ground? Well, Samuel Kier wasn’t setting the world afire with his miracle cure business. Then, a couple of kids set fire to the canal at Kier’s oil-plagued saltworks. That set Kier to stroking his beard. He was thinking about the growing scarcity of whale oil for lamps. Kerosene had recently been developed, but every inventor focused on using coal to make it. Coal oil, as it was called, was just too smoky and smelly. It’s safe to say that the circles in which Kier traveled included a great many men who had the 19th Century’s peculiar blend of huckster, entrepreneur, con artist, financier, and visionary. Future President James Buchanan was his partner in the canal boat business. After consulting a chemist in Philadelphia, Kier set up a small still at his Liberty Avenue headquarters. He distilled the petroleum and produced a burning fluid, the first barrel of refined petroleum. He called it carbon oil. But, regular oil lamps didn’t work well with the stuff. He sold it and helmet lamps to local coal miners. They gave it rave reviews. Meanwhile, thousands of miles away, whales were getting harder to find. Whalers in the 19th Century, mostly Americans, are estimated to have killed more than 200,000 whales in the North Atlantic. New England whaling ships started plying the northern and southern Pacific. There was no Panama Canal yet. That added to the cost. Kier set up a five-barrel still in a one-room structure roughly where the U.S. Steel Tower is today. An extension of the Pennsylvania Canal went up to it. A state historical marker recognizes the site as America’s first oil refinery. Kier kept the pump running at one of his salt wells until all it pumped was oil. That kept his coal miner lamp market supplied, but he would be needing more. His previously described network of business associates was already working that out. It set up Edwin Drake to figure out how to profitably get oil from slow seepages around Titusville and Oil City. He found out there was no money in gathering it up, or digging it up like coal. He tried drilling and the bore holes just collapsed. The locals laughed at “Drakes Folly.” The New York investors headed home. Then, Drake tried driving cast iron pipe into the bore hole as he drilled. The well cave-ins stopped. Oil rose up the pipe. It was not a gusher, but it flowed fast enough. That is to say it would be easier to get than coal or whale oil. Drake’s casing-method of drilling has been used ever since. Interestingly, he did not patent the idea. Many others got wealthy off it. Eventually, his connections got him a state pension to support him in old age. The first oil out of Drake’s well went to Kier’s still downtown. And, so the oil boom began. Oil Creek is a branch of the Allegheny River, and empties into it 100 miles above Pittsburgh. Pittburgh is, consequently, the great petroleum mart of the world. It is but five years ago that this material became important; and yet there were received at Pittsburgh during the year 1866 more than 16,000 barrels of it. Oil wells along Allegheny River at Bradford. The crude oil is floated down this impetuous river in the slightest-built barges — mere oblong boxes made of common boards — into which the oil is poured as into an enormous trough. Petroleum is lighter than water, and would float very well without being boxed in; only it would be difficult to keep each proprietor’s lot separate. It needs but a slight accident to knock a hole in one of these thin barges. When such an accident has occurred, the fact is revealed by the rising of the petroleum in the barge; and the vessel gets fuller and fuller, until it overflows. In a few minutes, the petroleum lies all spread out upon the swift river, making its way toward Pittsburgh, while the barge is filled with water and sunk. Still, whales were better off, at least for a while. Then came the mechanization and technology of the 20th Century. Whales became easier to find, chase and kill — mostly for food. Unbiased information is difficult to find, but some estimate at least 3 million whales were killed in that century. Uncertainty over how many whales remain prompted the International Whaling Commission to place a moratorium on whaling in 1984. It remains in effect, though enforcement is an issue. Lastly, some argue persuasively that whale oil would have disappeared as the choice lighting fuel even if the petroleum industry had never been born. Alcohol, they say, would have saved the day, if not the whales. Oil barge carries crude oil to Pittsburgh refinery. The number of refineries in the city were far more than the oil fields could keep busy for long. J.D. Rockefeller stepped in and consolidated many of them under the Standard Oil label. Kier’s five-barrel still remained in use long after he died in 1874. It spent many years at a plant in the village of Salina before the rusty remnants were rescued and eventually put in the Drake Well Museum in Titusville. That history detective story is here. I may have not given Kier’s Medicinal Rock Oil enough credit. His tuberculor wife, Nancy, outlived him by 10 years. She was 65. In 1858, 199 U.S. ships were registered to hunt whale. By 1876, the number was down to 39. It gradually withered to zero. Boston left the trade in 1903. San Francisco followed in 1921. New Bedford sent out its last whaler in 1927. To this day, Japan, Iceland and Norway continue commercially hunting whales for food, according to the International Fund for Animal Welfare. The Hagley Museum has an exhibit on patent medicine. You can check it out here. If you send the link to five friends, you will be wonderfully cured! 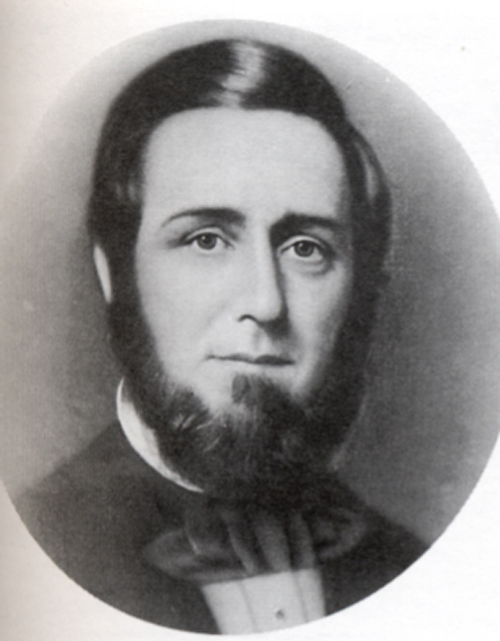 To read the unabridged version of James Parton’s exploration of Pittsburgh in 1866, go here. It's the Hemingway theme of Wordpress. Haven't seen anything I like better -- yet. My car gets a lot of compliments, so I went with its colors.